Istanbul’s Grand Bazaar is an undercover network of streets, packed with shops selling just about everything you can imagine. This is one of the largest and oldest undercover markets in the world with its history dating back to the 1400s. Common goods to find here include carpets, jewellery, ceramics, spices and dried fruit. 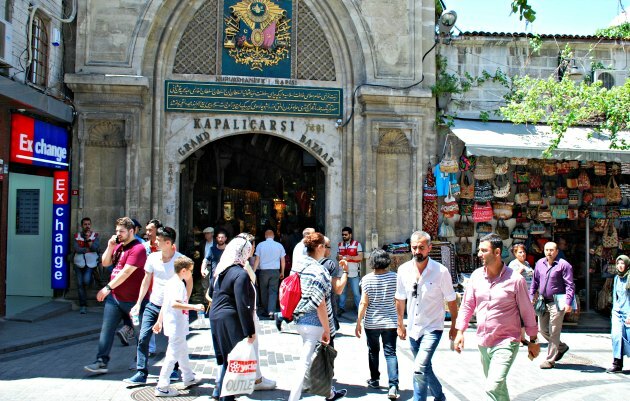 In total there are around 60 streets which make up the Grand Bazaar with around 4000 shops. When visiting, there are many entrances to the undercover part, but don’t miss out on the shops around the outside too. You’ll also find market stalls which set up around the edges. If you do see something you’d like to buy, you will need to barter for it. You can expect traders to start with a price that is at least double what they would actually sell it for – sometimes up to 75% more. Our advice is to decide what you want to pay and stick to it. If they are happy to meet you, fine. If not, they lose the sale. Bartering must always be done politely. We enjoyed the painted ceilings inside the Grand Bazaar as much as the goods on sale! 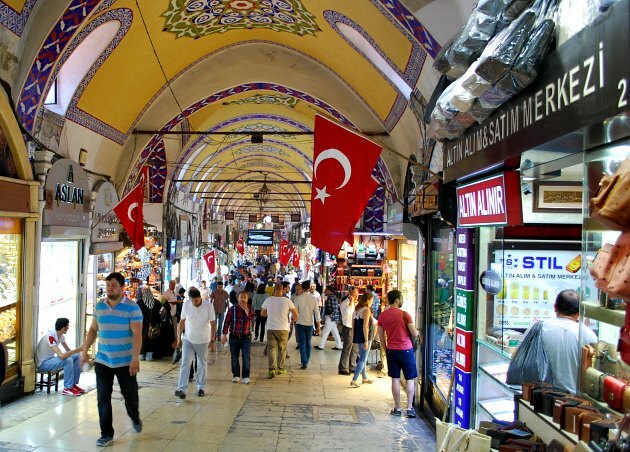 Please note that pickpockets are known to operate around the Grand Bazaar. 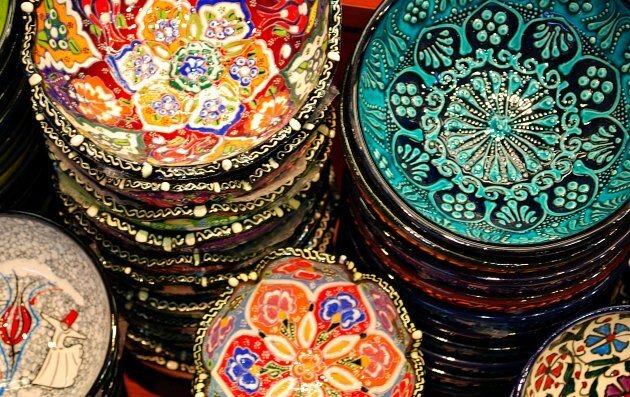 The Grand Bazaar is open Monday to Saturday from 9am to 7pm. The other market worth visiting is the bustling Egyptian Spice Market which is inside a ancient stone building down on the water’s edge. 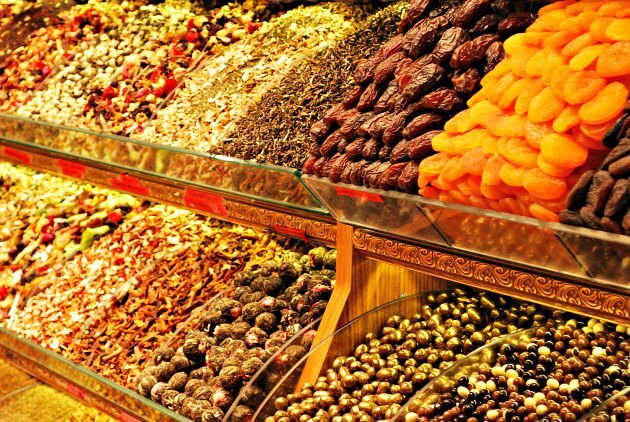 Here you’ll find lots more than spices with nuts and fruits also on offer. The streets between Grand Bazaar and the Spice Market are packed with stalls and shops selling other products from fresh produce to electrical goods. The Grand Bazaar,known in Turkish as Büyük Çarşı, covers a large area near to the Nuruosmaniye Mosque. Use the tram to get here, or the Istanbul Big Bus Hop-on, Hop-off Tour.